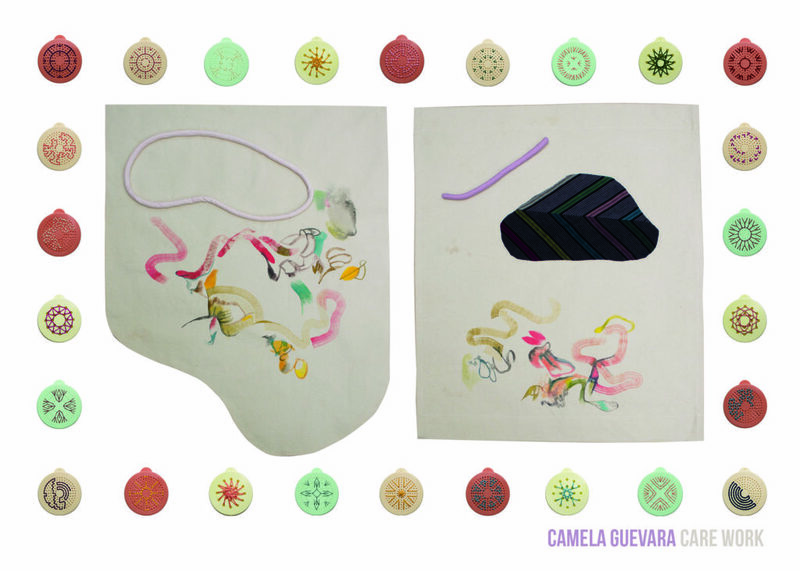 In Care Work, a new solo show at Redux Contemporary Art Center, artist Camela Guevara takes everyday household items — bits of thread, elastic bands, fabrics, sparkling pieces of scrubbing sponges — and creates spiraling, colorful patterns across her canvases. She imbues the things we see every day with a new artistic identity, at least partially to make the viewer see them, and the people who use them, in a different way. Using the premise of sewing as both a literal and metaphorical foundation, Guevara chose the name Care Work very deliberately to bring attention to those who tend to us and our loved ones every day. The idea that Guevara means to embed in the array of colorful fabrics and other simple, inexpensive items is that we should be a little more aware of the labor that they’re often used for, and of the people who do that labor. Guevara’s creations as a fabric artist take a subtle, but insightful approach, never over-cluttering the canvas with too much color or too many pieces. It’s an intuitive approach crafted by a person who’s taken refuge in art all of her life.